On the 12th day of April 2019, at approximately 8:48pm, Police observed a vehicle travelling Northbound on Grey Road 3 in the municipality of West Grey. Police conducted a traffic stop and when speaking with the driver, could smell an odour of alcoholic beverage. The driver was ordered to provide a roadside breath sample which resulted in a “Fail”. The accused was then arrested and transported to the Police station where he provided additional breath samples which read well over twice the legal alcohol limit. Subsequent to the Police investigation, a 36 year old West Grey man was charged with Operation while impaired and Operation while impaired with blood alcohol concentration (80 plus). The accused driver’s license was seized and suspended for 90 days immediately and his vehicle was towed and impounded for 7 days. The accused was processed and released by way of promise to appear where he will attend the Walkerton Courthouse to answer to the charges. Sometime between 2:00a.m. and 9:00a.m on April 6th the windshield was smashed out of a vehicle parked on Elizabeth St .in Durham. Police are looking to the public for assistance and asking that anyone with information regarding this crime contact the West Grey Police Service at 519-371-6911 or to contact Crime Stoppers at 1-800-222-8477 if you wish to remain anonymous. On Sunday April 7th, 2019 an officer on patrol observed two males on Grey Road 3 in the former Normanby Township. One of the males was known to have an outstanding warrant for his arrest on charges of assault and failing to comply with a recognizance. The man was arrested without incident and was held for a bail hearing where he was subsequently released with a first appearance date later this month. On Friday April 12th, 2019 at approximately 10:02am, police were dispatched to a Durham residence regarding a domestic disturbance. Upon arrival the victim reported a historic assault which had resulted in injuries. The victim provided a statement and explained to Police that a weapon been used in the assault and described an instance in which she had been forcibly confined. Subsequent to investigation, Police had reasonable grounds to believe that grounds existed for an arrest and the suspect was contacted. The 42 year old Durham man turned himself in to Police where he was placed under arrest and charged with assault cause bodily harm, assault with a weapon and forcible confinement. The accused was processed and later released on conditions as well as a promise to appear on the 1st day of May 2019 at the Walkerton Courthouse where he will answer to the charge. 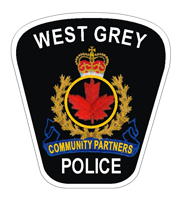 West Grey Police Service is committed to investigating all incidents relating to domestic violence and providing assistance to victims. Investigators urge anyone who is being abused or is aware of abuse occurring to contact police. On April 8th, 2019 a vehicle, which had been stolen out of Caledon, was spotted parked on a roadway in Hanover. West Grey Police assisted in searching for the suspect who had been seen fleeing the area. A press release was issued and as a result two West Grey residents, one from the West Back Line and one from Douglas Street in Durham, contacted police advising that a truck matching the description of the stolen vehicle had been on both their properties within a two hour time span the previous evening. In both instances the resident successfully scared off the culprits before any further thefts could occur. West Grey Police would like to thank all residents who came forward and highly recommend for the public to call police immediately if you encounter an unknown vehicle on your property. On April 12th, 2019 West Grey Police Service executed an outstanding arrest warrant on a 37 year old Hanover man. The man was held for a bail hearing where it was ordered that he be remanded in custody as he was already on charges from another jurisdiction.